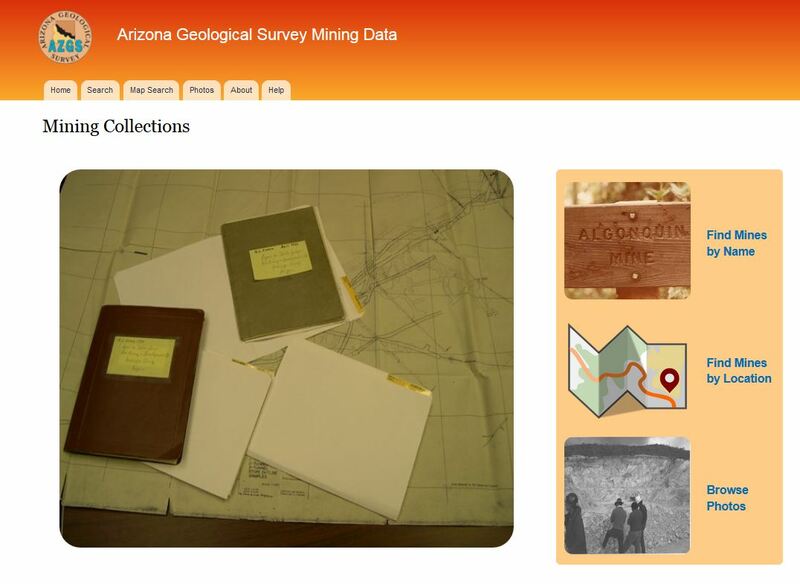 Historic one-of-a-kind Arizona mining documents - once filed away in cabinets and boxes - are now online, discoverable, and accessible at the Arizona Geological Survey Mining Data website (http://minedata.azgs.az.gov/). More than 20,000 files, maps, and reports contributed by dozens of exploration geologists and mining firms are now available. The website exposes more than 8,500 geologic and engineering reports; 6,800 maps – geologic maps, mining claim maps, maps with assays, plats, underground maps and cross sections; and 5,500 historic photographs dating from the 1890s to 2000. The reports comprise over 400,000 pages of materials. Thousands of additional documents and supporting data will be added to the site over the next months and years. This new online resource is being premiered in time for the 2016 Society for Mining, Metallurgy & Exploration Annual Conference and Expo in Phoenix from Feb. 21 – 24. The collection includes major exploration holdings from the Arizona Department of Mines and Mineral Resources, Walter E. and Grover Heinrichs, James Sell, A.F. Budge Mining Ltd., Cambior Exploration, among many others. Besides being a repository of Arizona mining history documents, these data can be valuable assets for mining firms and prospectors exploring for mineral resources. “The mining repository contained historic maps for the Van Deemen Gold project in Mohave County … showed the location of 44 additional drill holes and allowed us to integrate that information with existing drill logs, assays …, “ said Barbara Carroll, part of an exploration team investigating Van Deemen Gold property. 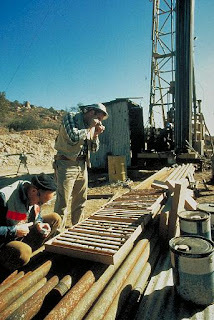 Since the 1850s, Arizona has been a mecca for prospectors, exploration geologists and mining firms seeking copper, gold, silver, molybdenum, zinc, lead, manganese, tungsten, uranium, and coal, turquoise and semi-precious gems. Collectively, they left a mile-high paper trail of hundreds of thousands of pages, tens of thousands reports, well logs, letters, photographs, and geologic and mine maps. From 1939 to 2010, the mining documents comprising this online repository were donated by exploration geologists and mining firms to the Arizona Mines and Mineral Resources Department. The Mining Data site includes an applied search tool filtered by key words, mine names, collections, time and place. The geographic search tool provides for a radius search of 1 to 100s of miles from a point of interest. Funding for this project provided in part by multiple matching grants from the U.S. Geological Survey National Geological and Geophysical Data Preservation Program. AZGS has an additional ~400,000 pages of reports from other states and countries. we are seeking funding sources to digitize those and make them publicly available. What if a volcanic flow dammed the Grand Canyon? Lava eruptions dammed the Grand Canyon in the geologic past, with the Colorado River backing up until it broke through the eruptive materials. What if it were to happen again? 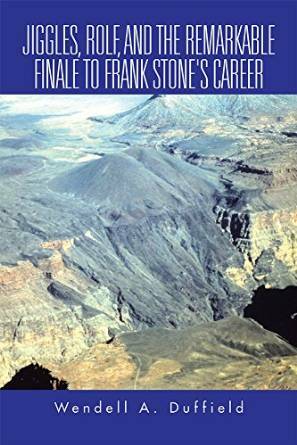 Retired USGS volcanologist Wendell Duffield has published a fictional book built around that premise. "Jiggles, Rolf, and the Remarkable Finale to Frank Stone's Career," is published by iUniverse.com and available through Amazon and commercial book sellers. A total of 14 individuals signed in to support the bill and 366 individuals, mostly Geologists and Landscape Architects, signed in to oppose the measure. There was additional opposition from the American Council of Engineering Companies of AZ, the Arizona Chapter of Associated General Contractors, the Arizona Petroleum Marketers Association, the Arizona Planning Association, the Arizona American Institute of Architects and the Arizona Board of Technical Registration. The bill is being pushed by Arizona Governor Doug Ducey as a solution to address the perceived over licensure of professions in Arizona. The hearing for HB 2613 lasted approximately 2 hours and the committee heard testimony from four Geologists against the bill. The bill was passed on a party line 5 - 3 vote with the Democratic members dissenting. The bill has two procedural hurdles before being considered by the full Arizona House of Representatives for an up or down vote. During testimony the Governor’s staff noted that the bill needs additional work and assured the interested groups that they will have input in this process. The American Institute of Professional Geologists and the Association of Environmental and Engineering Geologists is [sic] leading the opposition to this measure and is [sic] seeking to remove the Geologists from this bill. The four geologists that spoke were Steve Noel (geologist on the BTOR), Dawn Garcia (Tucson, past AIPG AZ Section President), Tiana Rasmussen (AEG representative), and Barbara Murphy (past national AIPG president). On Saturday, I had the pleasure of presenting a geologic map dedicated to Larry Fellows, my predecessor as Director of AZGS. The presentation was made during the AIPG Arizona Chapter's annual business meeting at the AZGS offices in Tucson. Many of the AIPG national board of directors were also in attendance. The map is "Geologic Map Database for Aggregate Resource Assessment in the Phoenix Metropolitan Area and Surrounding Regions, Arizona," authored by Phil Pearthree, Brian Gootee, Stephen Richard, and Jon Spencer. This map is dedicated to Dr. Larry D. Fellows, first official State Geologist of Arizona, who transformed the Bureau of Geology and Mineral Technology into the modern Arizona Geological Survey, in recognition and appreciation of his contributions to advancing the understanding of the geology of Arizona and its applications for societal benefits. The Arizona Senate Appropriations Committee with hear SB1440, the Mining & Mineral Museum Transfer bill, at a meeting starting at 2 PM, Tuesday, February 16, in Senate Hearing Room 109. During a hearing in the Government Committee last week, committee members repeatedly quizzed the lobbyist for the Arizona Historical Society about whether there are any plans or intent to re-open the museum. Lobbyist Jim Norton finally explained that unless AHS was given specific direction and funding, they had no plans on opening the museum, which has been closed since 2011. AHS receives state funding to cover the rent of the building and for one curator. In addition, fees from the Centennial License Plate fund go to AHS for developing the museum. Comments by Jim Norton implied they have received at least $750,000 from those fees so far. SB1440 would transfer the museum and its assets to the Arizona Geological Survey to re-open the facility as the Arizona Mining, Mineral, and Natural History Education Museum. A similar bill passed the legislature last year but was vetoed by the governor. Click on "Request to Speak"
Click on "Search" - this should bring up the next hearing.